A complete hamstring avulsion can occur at the pelvis, the shinbone, or a complete tear within one of the hamstring muscles; the biceps femoris, semitendinosus, or semimembranosus. Although hamstring strains are common among athletes, complete tears of the hamstring are rare and may go unnoticed. If you have suffered from a forceful pull of the hamstring it is recommended that you see a doctor for a proper diagnosis as symptoms of a complete tear are similar to those of a hamstring pull or strain. Early diagnosis of a complete hamstring tear is very important. If treatment is delayed, a torn hamstring tendon may pull further away from the bone. This can result in a greater loss of power, the need for surgery, or a more serious condition in the lower back, buttock, calf, or posterior thigh. A hamstring avulsion that occurs at the origin of the hamstring tendon, where it attaches to the ischium, is the most common type of hamstring avulsion. It is referred to as a proximal tendon avulsion. In this case, the hamstring tendon tears completely away from the bone, sometimes taking a bit of fractured bone with it. If this type of hamstring avulsion is diagnosed in the early stages and treated accordingly, there is a greater chance of rehabilitation and restoration of full hamstring muscle function. 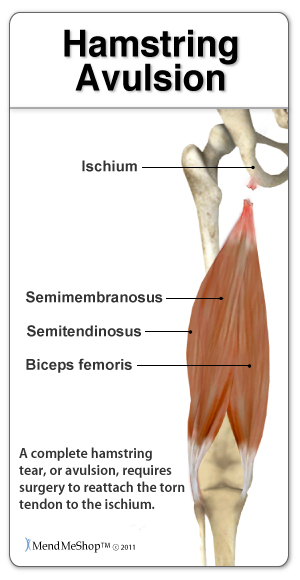 A hamstring avulsion occurring at the insertion of the hamstring muscle, where it attaches to the tibia or fibula, is less common than a tear at the ischium. This type of avulsion is called a distal tendon avulsion. A complete tear may also occur in one of the hamstring muscles, tearing the muscle in half. The sooner a hamstring avulsion is diagnosed, the better. If surgery is required, prompt reattachment of the hamstring tendon is important to avoid poor leg control, cramping, loss of power, difficulties running or walking, and deterioration in the hamstring muscles. If a hamstring avulsion is left untreated it may lead to sciatic paresthesias, sciatic neuralgia, or hamstring syndrome which can cause chronic pain in the lower back, buttock and posterior thigh region. To read more about hamstring avulsion surgery visit our Hamstring Surgery page. Most hamstring injuries occur with a sudden forcible contraction of the muscles against resistence, when the muscle contracts while it is lengthened. For example, when a water skier is pulled forward or a sprinter pushes off to propel forward. the hamstrings are weak from inactivity or previous injury. The first step for dealing with an avulsion is to visit your physician for a proper diagnosis. Only your physician will be able to diagnose a hamstring muscle or tendon rupture properly, and the pain or current disability you are experiencing may be caused by something serious and life threating. This is why we always recommend getting to a doctor promptly for a proper diagnosis. Treating your hamstring avulsion promptly and correctly is essential to getting rid of your pain and restoring function to your upper thigh. Proper treatment will get you back to regular activities sooner, stop your pain, and reduce the risk of future re-injury. The 1st step for conservative treatment of your hamstring injury is to reduce swelling. This is why doctors and surgeons recommend the use of a Cold Compress or Ice Pack within the first 72 hours of an injury and/or immediately following surgery. The use of a Cold Compress or Ice Pack is known and trusted by most medical professionals. This is why for years doctors, trainers and other medical professionals have recommended RICE (Rest, Ice, Compression, Elevation) to treat the pain and swelling of fresh injuries, chronic pain, after any re-injury, and especially after surgery. For those that have undergone reattachment surgery for hamstring avulsions, we outline a conservative home treatment protocol here in our post-surgery page.